Rental City | A Deal to Love! So sweet that it's perfect! Home / Individual Store Locations / Ajax / A Deal to Love! February is the month of love, and we’re sure you are going to love this deal! We’re clearing out old stock to make room for the new spring collection, and that means you can build the perfect package to suit your lifestyle. 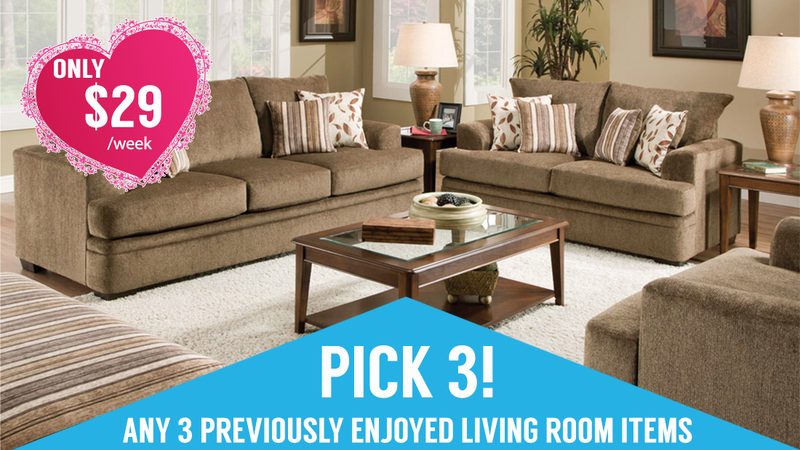 Build an entire living room set and get it all for only $29/week! And the best part is that we’ll even deliver and set it all up – same day when possible! Hurry in, when they are gone – they are gone! OFFER EXTENDED UNTIL MARCH 31! This deal is ongoing at all of our locations right now 🙂 You can reach Bryan (the manager) and his team at: (705) 728-4000. If you can’t make it in to see us, be sure to ask about our Shop-at-Home virtual tour too! Thanks for considering Rental City!